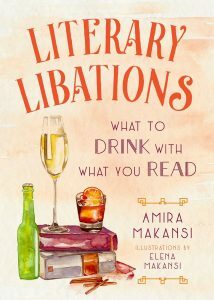 Amira K. Makansi is the author of LITERARY LIBATIONS: What to Drink With What You Read. She is a graduate of the University of Chicago and spent her first few years out of college working in the vineyards in France. With her mother Kristina Makansi and her sister Elena K. Makansi, she is the co-author of the dystopian SEEDS series, written under the pen name K. Makansi. 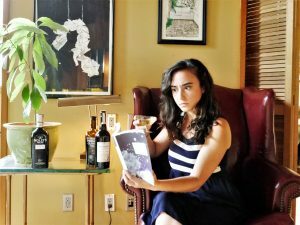 Amira is now a full-time writer based in Ashland and you can see her at book launch events at Bloomsbury Books on September 6 (7-8 PM) or at Irvine & Roberts Winery on Sept. 4 (5:30-7:30 PM). Ed Battistella: I really enjoy Literary Libations—I virtually guzzled the book. How did you ever come up with the idea for a book pairing great literature and good drinking? Amira Makansi: While I was working at a California winery called Peachy Canyon, I spent a lot of time climbing around in barrel stacks for days on end. It was mindless, solitary work that left plenty of time for thinking. During one of these periods, I started brainstorming what wine styles I would drink with certain genres of literature. Rosé with romance novels, for instance. Petite Sirah with thriller and suspense novels. It occurred to me that this concept would make a great blog post, so when I got home, I jotted it down. The post went live the next day, and I got a really positive response from my readers. A day later, my dad called me and said, “Amira, that post was funny. Have you considered writing more pairings like that?” It was then that the idea of one day turning it into a fully-fledged book materialized, and voila, the seed took root. EB: How did you choose the books to include? You’ve got a lot of my favorite books and some really intriguing pairings. AM: I could spend hours answering this question, because there’s a myriad of different reasons why each book was included. But the basics are: I wanted to have something for everybody, which meant touching on many different genres. I wanted to have roughly the same number of books in each genre. And I wanted to include women and writers of color where possible. After that, I just had to fill out each genre. I did have a few rules: 1. No books by the same author. (Tolstoy and Dostoyevsky are the only exceptions.) 2. No books published within the last ten years. (Again, there were a few exceptions—I think the most recent book I included was published in 2011.) 3. The book had to be both well-read and well-known within the genre. EB: I was nodding in agreement with the pairing of The Metamorphosis with absinthe and the pairings for The Fellowship of the Ring, Cider House Rules, Harry Potter and the Sorcerer’s Stone, Dracula, The Shining, and many more. By some took me by surprise. How did you happen to come by the pairing of A Confederacy of Dunces with Budweiser? That seemed so right, and sad at the same time. But I was also intrigued by the pairing of Lady Chatterley’s Lover and Oregon Chardonnay. Can you elaborate on those two? AM: Oh, yeah! I love those two pairings. In fact, I’ll be discussing the pairing of Lady Chatterly at the book launch party at Irvine & Roberts on September 4. (Which anyone and everyone is welcome to come to, by the way!) When I think of A Confederacy of Dunces, I think of quintessential, old-school Americana. I also think of hot dogs, because we all know how Ignatius loves his hot dogs. (The scene where he eats all the hot dogs at the stand he’s working is one of my favorites.) From a personal perspective, hot dogs make me think of baseball, and baseball makes me think of cheap American beer. They’re all intertwined. I like to imagine Ignatius on the streets of NOLA somewhere with a hot dog and a bottle of Budweiser in hand. As for Lady Chatterley, that book is so seductive, so subtle, so intricate. There are layers of power—the dynamic between men and women, between the aristocracy and the working class, between the opening doors of sexuality and the cloistered Victorian attitude. To me, Oregon Chardonnay represents all those layers. A tug in one direction, an opening in another. Conflict, power, and balance. California Chardonnay, by and large, is a little too voluptuous to fit these needs. And Burgundy, by contrast, is often quite austere. We need something in the middle—something with tension, precision, and sexuality—to meet Lady Chatterley. That’s where Oregon Chard comes in. EB: What was the toughest book to pair? AM: Oh, man. There were some that were really challenging. By and large, the classics sections were pretty straightforward. I finished those first. By contrast, I agonized over Infinite Jest. I really wanted to get that one right, because I love the book, but it’s so massive. How can you come up with one single drink to fit that book? That’s why I ended up with Pinot Noir, in the end—because it, too, is so versatile, so adaptable. (At least in the glass—out on the vine is a different matter!) Brave New World was tough. I’m still not sure I got that one right. The pairing works, but could it be better? Absolutely. I think the hardest pairing in the book was The Left Hand of Darkness by Ursula K. Le Guin. It didn’t open itself in any clear way. It’s so foreign, so speculative, that there wasn’t much connection with our world, no easy way for me to link it to something drinks-related in our universe. I’m pleased with the pairing I chose, but that one could go in so many different directions. EB: I imagine you’ve read all the books, but have you tried all the drinks? Or do you have a team of drinkers working for you? AM: Actually, it’s the reverse! I haven’t read all the books (at least not cover-to-cover), but I’ve had almost all the drinks. I’d read, I think, a third of the books I selected for inclusion prior to starting work on Literary Libations. The ones I hadn’t read, I checked out from the Ashland library (thank you, librarians! ), but I was operating on a relatively short deadline, so I didn’t have the opportunity to read them all. I made sure to read the first fifty pages, and then, depending how hooked I was, I either finished the book or skimmed the rest. But the drinks—I’ve had a lot of drinks in my life. I’m the kind of person who likes to experiment, so I’m always trying new things. Not to mention I’ve been working in food and beverage since I got out of college. (That’s nine years now.) There are a few drinks I haven’t had, though: Mamajuana is one, and baijiu is another. I haven’t ever tried recioto della Valpolicella, which is the pairing for Romeo and Juliet. But it sounds amazing. And I haven’t ever had a blue cosmopolitan, which goes with Storm Front by Jim Butcher. I hope to never have a Knifey Moloko (A Clockwork Orange) or a Pan-Galactic Gargle Blaster (The Hitchhiker’s Guide to the Galaxy.) Both of those sound terrible! EB: There were some drinks I had never heard of, like the Corpse Reviver and the Olive Oil Martini and Mamajuana. How did you find all these? Do you have a favorite? And thanks for the various recipes! Now I can make Butterbeer. AM: I would say my favorite discovery from the writing process was the Olive Oil Martini. That drink is amazing! It’s astonishing how the addition of something so simple like olive oil can change a classic cocktail so dramatically. I’m not a martini drinker, but those few drops of olive oil change everything for me. But like I said above, I like to experiment. My favorites change yearly, even monthly. These days, when it comes to wine, I’ve been in love with dessert wines: eiswein, Sauternes, tawny port. A whiskey sour with lime and egg white is my standby cocktail. And on the beer side, I’m still on the roller coaster of sour beers. EB: Reading the way you describe wines and beers and the way you describe prose, I am beginning to think the language used has some intriguing parallels. What do you think? AM: Absolutely. That’s quite intentional. I’ve spent most of my career in wine, from restaurants to distribution to production. And I think one of the barriers to understanding wine—one of the most misunderstood things in the world—is that folks are afraid they’re not using the right language, the right words to describe what they’re experiencing. The corollary to that is a pretentious insistence on using only proper language. I want to break away from that. In Literary Libations, and in general, I try to use emotive, evocative language to describe sensory experiences, because sensory experiences are deeply emotional. We form deeper memories when they’re associated with a strong scent or taste, whether pleasant or unpleasant. And emotions are very sensory. Vivid memories are often accompanied by strong scents, flavors, or sounds. 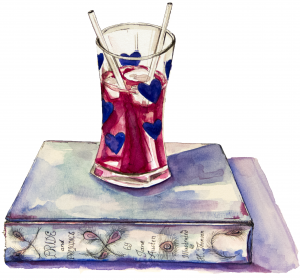 And that’s another part of the reason why I think books and drinks go so well together: when the flavors complement the reading experience, your experience of both the book and the drink becomes so much deeper. EB: You covered the literary canon and then some, from the classics to mystery, fantasy, scifi and young adult, but of course you couldn’t mention everything. But I’m wondering, just off the top of your head, what would you pair with The Oxford English Dictionary? AM: Off the top of my head? Beer fermented with wild yeasts; sour beer. Language is a wild thing, constantly growing and evolving in ways we can’t predict. So are yeasts. I’m sure brewers and dictionary-writers could spend a fair bit of time chatting about the pleasures and challenges of cataloging and utilizing a thing that is so diverse and unpredictable. And I, for one, would like to be drinking something that celebrates that diversity while reading through the dictionary. EB: Tell us a little about your background and other interests. Have you always been a writer? AM: In some ways, yes; in others, no. I was a writer when, at nine years old, I penned a thirty-page handwritten (in glittery green gel pen) fanfiction of Brian Jacques Redwall series, about a group of mice and rabbits living together in the woods who were occasionally terrorized by a large cat. I was a writer when, in fifth grade, I typed out a fifty-page Harry Potter fanfiction narrated by Fawkes the phoenix and his experiences with Moony, Wormtail, Padfoot and Prongs. But reading—and writing—fell by the wayside in high school and college, when reading for pleasure seemed more like torture after spending hours and hours poring over scholarly papers or books for school. Even after I graduated college, I felt like I had to ease back into reading books. It took another two years before I was reading again for pleasure. But in 2012, by the time I’d started reading again, the Muse was close at my heels, this time in the form of my mom, Kristy. She’d had a dream she felt compelled to turn into a story. She asked my sister and I what we thought—and we loved it. Then she asked us to pitch in and help her write the story. Ten months later, we had a book on our hands. That was the genesis of the Seeds trilogy, and the book we’d written together eventually became The Sowing. EB: I understand you are from a family of writers. How’s that? AM: My parents have been writers for as long as I can remember. My dad’s had a number of short stories published—he’s the true “literature” nerd in our family. I have distant, toddler-style memories of opening drawers and finding pages of my mom’s work-in-progress novels—she loves great literature as well, but doesn’t shy from action and adventure, either. When she invited me to help write her dream into a story, I felt compelled. That’s when my sister and I got into writing as well. AM: Ha! You’re not the first one to ask, but I haven’t quite found an answer yet. If I had to answer off the cuff, I would say, a shot of high-fructose corn syrup. Our book is all about agriculture, food, and farming: from the dangers of genetic modification (which isn’t intrinsically bad, but certainly can be) to how food chemistry can affect brain chemistry. High-fructose corn syrup kind of embodies all the terrible things about large-scale agriculture. It’s an useless product that was turned into a fattening, mind-altering food (sugar makes you crave more sugar), the result of artificial surplus of corn that was created when agricultural subsidies met a highly profitable cash crop—and, subsequently, genetic modification. If there were a way to distill the message we’re trying to pass along into a single drink, it would be the dangers of stuff like high-fructose corn syrup. EB: Thanks for talking with us. Cheers. AM: Thank you for these fantastic questions, and for all your support and enthusiasm. Cheers, indeed! This entry was posted in Ideas and Opinions, Interviews, Literary Events in Southern Oregon. Bookmark the permalink.